Seriously! You guys are great. You said such nice things to me in my whining moment. You're the best blog friends a girl could ask for. What a variety....some are family, some are friends I've known for almost 20 years (ha ha ha), some are friends made in the last few years and others I've never even met. Yet. And an anonymous.....I seriously want to know who you are. I've got a guess, but I wanna know! 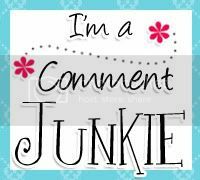 Can I say how nicely your comment junkie button matches your blog! Are you coming to my lunch to hang out with your bloggy girlfriends? in a some ways we all need a little something from each other!!!!! YAY! I'm glad you're back!!!! Wish I were going to be in Utah then! Blogging helps me feel not so isolated and it gives me laughter and socialization without too much obligation.